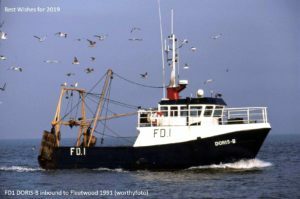 This entry was posted in Inshore Fishing Vessels on 18th December 2018 by Roger Jones. 27.10.1943: Registered at Fleetwood as PEGGY (FD222). Owner W. Leadbetter, Fleetwood. 12.1959: In fog, stranded near Fleetwood Pier about 40 yrs from the Promenade. Sk. 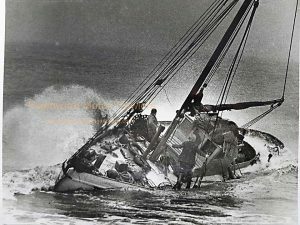 John Holden and Mate Albert Mair tried to keep her afloat but were unsuccessful and picked up by Fleetwood lifeboat, ANN LETITIA RUSSELL (Cox. Albert Wright). 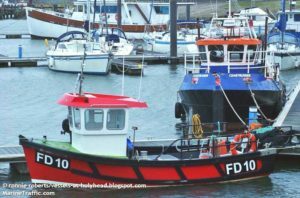 Subsequently salvage undertaken and engine, mast, ballast and some fishing gear recovered. Boat not insured and a fund to help the owner set-up by business men Norman, Frank, Leonard and Lawrence Horsley. 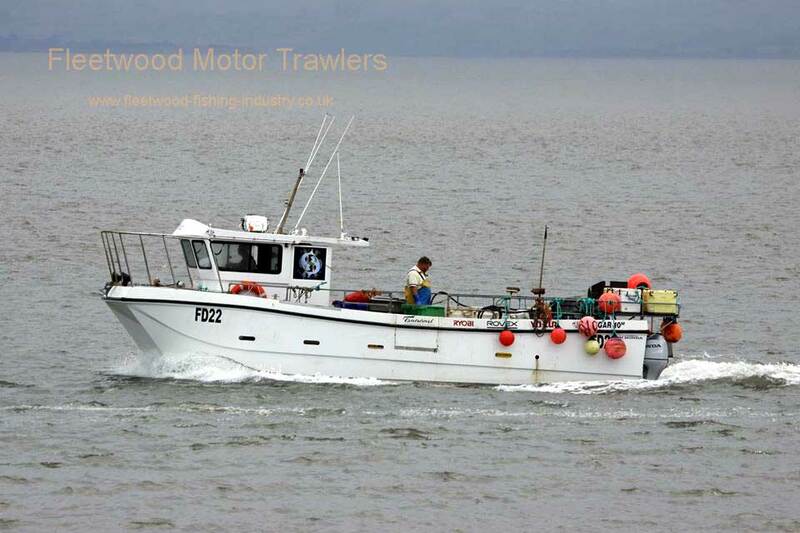 This entry was posted in Inshore Fishing Vessels, Lost on 12th August 2018 by Roger Jones. 27.11.1942: Ordered by The Admiralty from Richards Ironworks Ltd, Lowestoft (Yd.No.324). 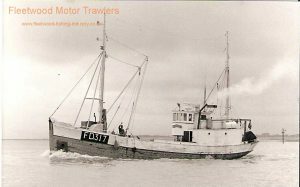 15.11.1943: Launched by East Anglian Constructors Ltd, Oulton Broad. 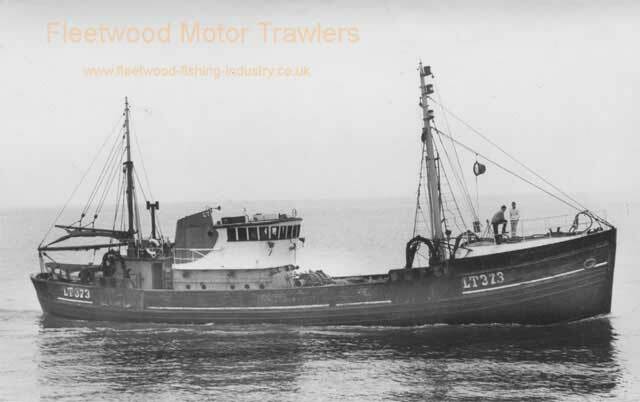 3.1944: Completed by Richards Ironworks Ltd as MFV1504 (1x20mmAA). 11.12.1946: Sold out of service. 1948: Sold to George William Brand Leslie, Sumburgh, Shetland. 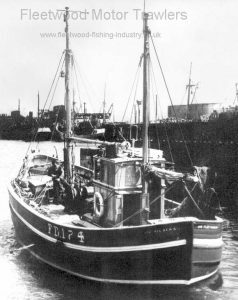 1.11.1948: Registered at Lerwick (Part IV) as BETTY LESLIE (LK497), 77g. 77n. George W. B. Leslie designated managing owner. Modified at St. Monans, Fife to fish a Norwegian purse net but not designed for this method and trials not a success (first UK seiner). 1951: Fished great lines as far as Faroes and Iceland. 12.4.1952: Registered at Lerwick (Part I) as BETTY LESLIE O.N.185731 (LK497) by George W. B. Leslie, Cults, Aberdeenshire. George W. B. Leslie designated managing owner. Continued to fish great lines as far as Faroes and Iceland and drift netting in North Sea. 4.1954: Sponsored by WFA, shark fishing off Shetland. Fitted out at Lerwick. 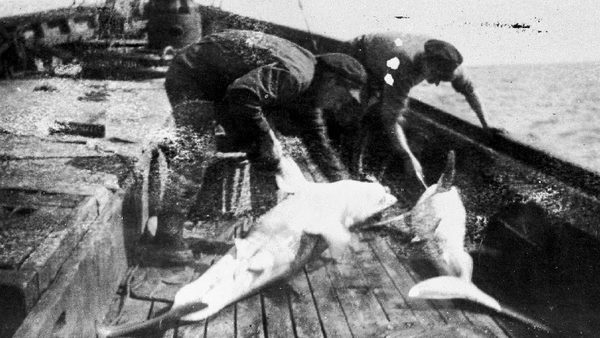 6.4.1954: Sailed Lerwick to pursue sharks. 3.5.1954: At Aberdeen landed mostly from the North Rona grounds, 80 porbeagle sharks, 546 stone sold for 14/6d per stone to a syndicate. 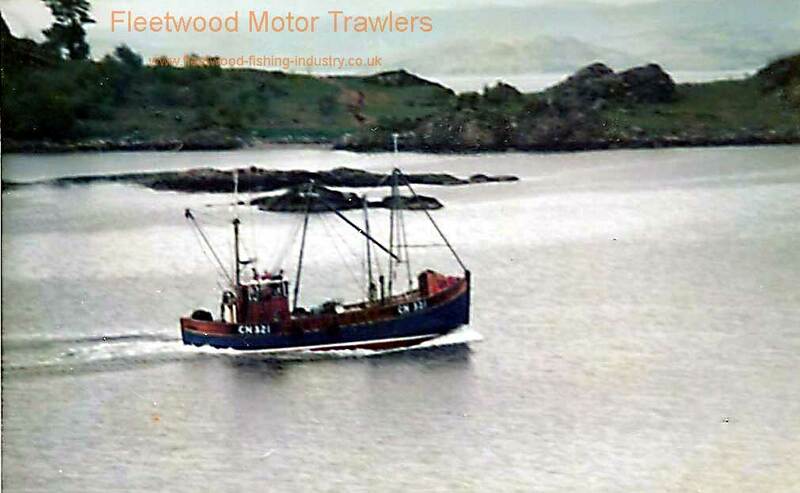 Late 1950s: Engaged in side trawling. 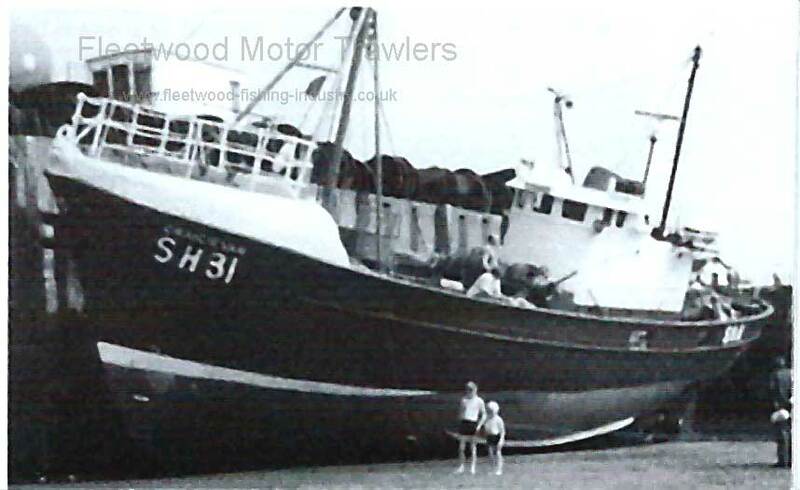 9.8.1960: Sold to Boston Deep Sea Fisheries Ltd, Fleetwood. 1960: Re-engined with 5-cyl 375bhp HR5 Crossley (engine made 1951) by Crossley Brothers Ltd, Openshaw, Manchester. 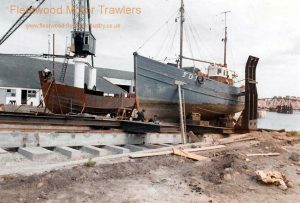 1.1961: Completed conversion to side fishing trawler by Richards Ironworks Ltd, Lowestoft. Remeasured following survey 114.51g 47.86n 96.7 (loa) x 22.3 x 10.9 (summer draught) feet. 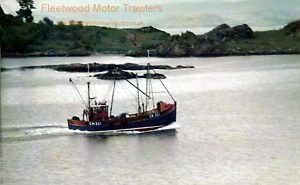 26.1.1961: On completion of modernisation and conversion to a side trawler. Registered at Lowestoft as BOSTON MOSQUITO (LT373). Basil Arthur Parkes, Hessle designated manager. 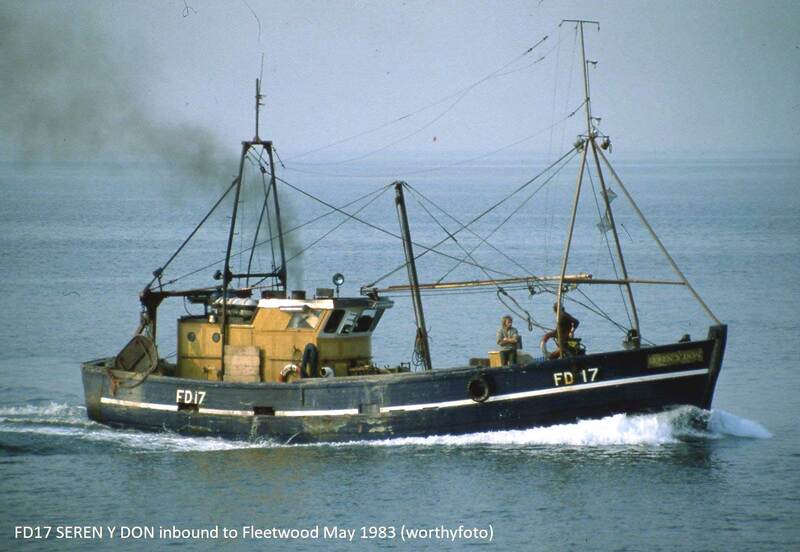 Early 1960s: Seasonal trawling out of Fleetwood. 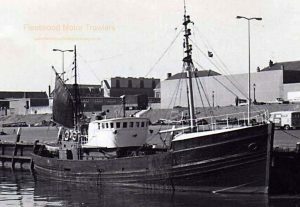 14.10.1962: Alongside in Wyre Dock. 2nd Eng John Riddock Young discovered fire in wheelhouse. Sounded alarm on ship’s siren. Attended by PC Edward Macdonald BTC Police and PC Norman Pott, Lancashire Constabulary who managed, despite dense smoke, to contain the fire until Fleetwood Fire Brigade arrived and fire was extinguished. Considerable damage to wheelhouse, including radar, radio and navigational instruments. 16.11.1965: In heavy weather stranded at Scar Point, North Shields. 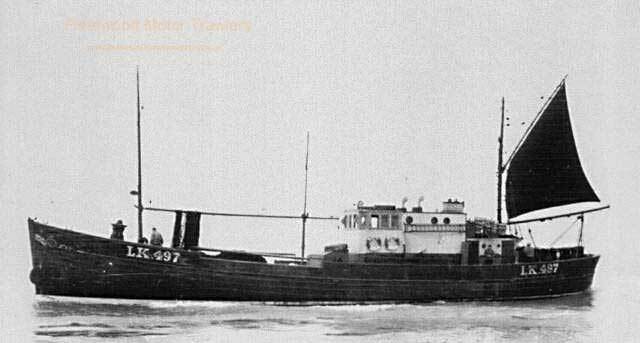 Refloated by tug BAMBURGH (119grt/1956) and taken into River Tyne. 26.11.1965: Off the Tyne suffered ingress of water and sent out distress. 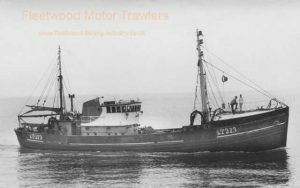 Steam trawler ROSS CANOPUS (979grt/1946) responded and escorted into River Tyne. 1.4.1966: Sold to Saint Andrew’s Steam Fishing Co Ltd, Hull. Basil Arthur Parkes designated manager. 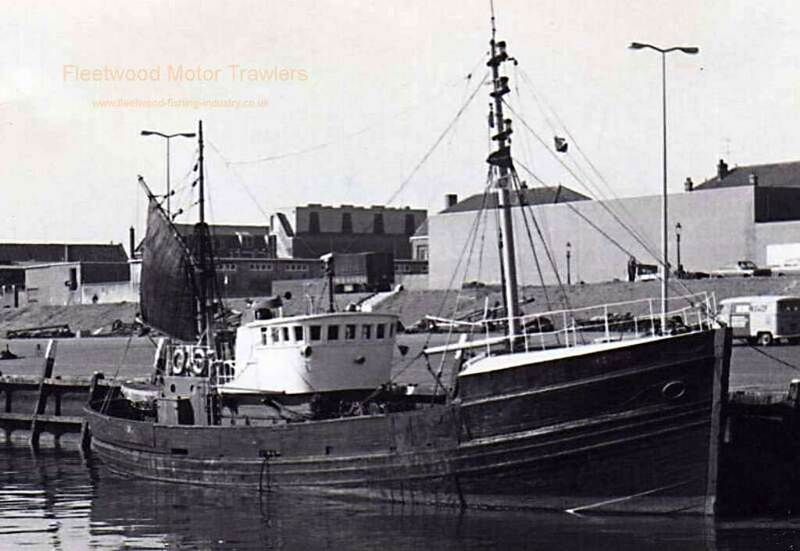 27.8.1966: Sold to Looker Fishing Co Ltd , Aberdeen. Basil Arthur Parkes designated manager. 1967: Employed on offshore platform standby/safety duties. 14.6.1967: Sold to Looker Fishing Co Ltd (32/64), Aberdeen and Putford Enterprises Ltd (32/64), Paignton. 4.7.1972: Sold to David James Sadd, Norwich. 17.10.1972: Lowestoft (Part IV registry closed). 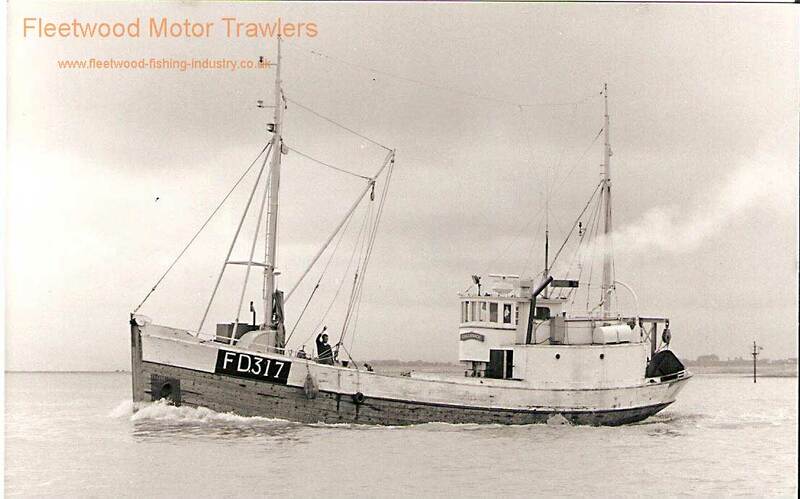 28.8.1972: Sold to Mrs Lillian Ann Rodgers, Norwich (JR Marine Ltd, Norwich). 23.1.1973: Registered at Lowestoft as APRIL DIAMOND. JR Marine Ltd, Norwich designated managers. Lowestoft registry closed in error “ Sold to Greek interests”, but expunged. 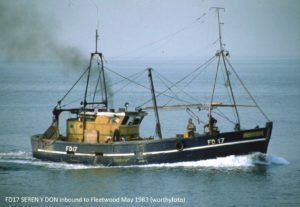 18.8.1973: Arrested at Scheveningen, Netherlands having been caught with illegal immigrants onboard for passage to UK; Skipper and Mate detained. Vessel held by Netherlands authorities as surety to cover cost of flying 26 Asians home (c£6,000). 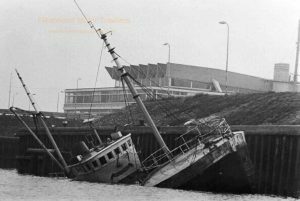 1975: Sunk at berth in Scheveningen, later craned from water in sections, engine and other useable parts removed and sold. 1979: Ship seized to recover court costs, hulk sold for breaking up. 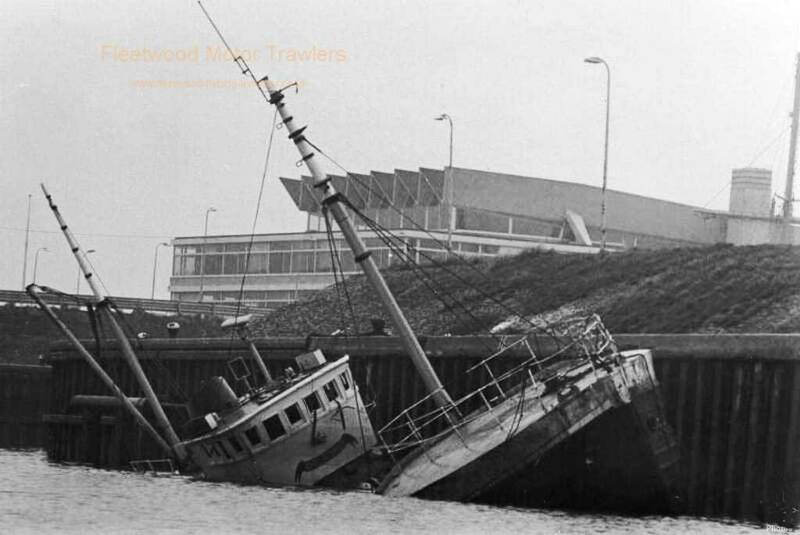 20.6.1990: Lowestoft registration certificates finally cancelled. 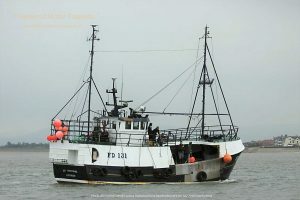 This entry was posted in Boston Deep Sea Fisheries on 4th August 2018 by Roger Jones. 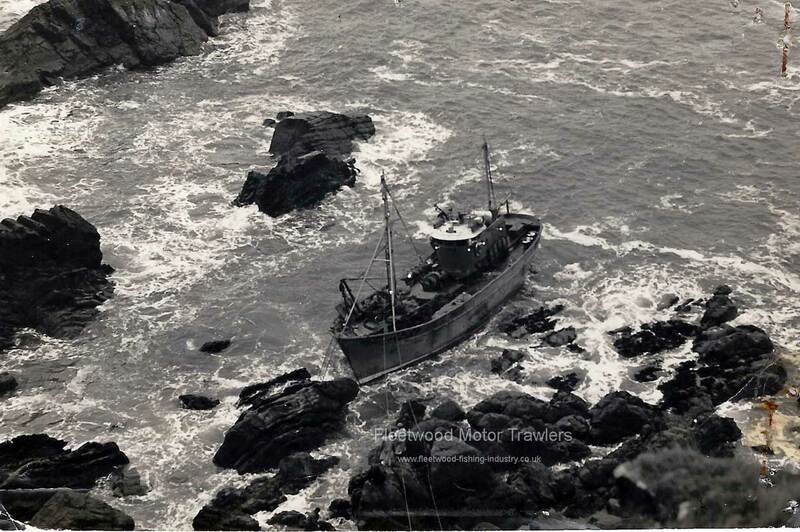 1960: Stranded at Fast Castle, near St Abb’s Head, in a storm. Refloated at high water, with little damage. 1970: Owners John N. Ward & Son Ltd, Fleetwood. 1976: Owners Charles J. S. Simmons, Scarborough & Others. 1983: Owner Jack Robinson, Hull. 19?? 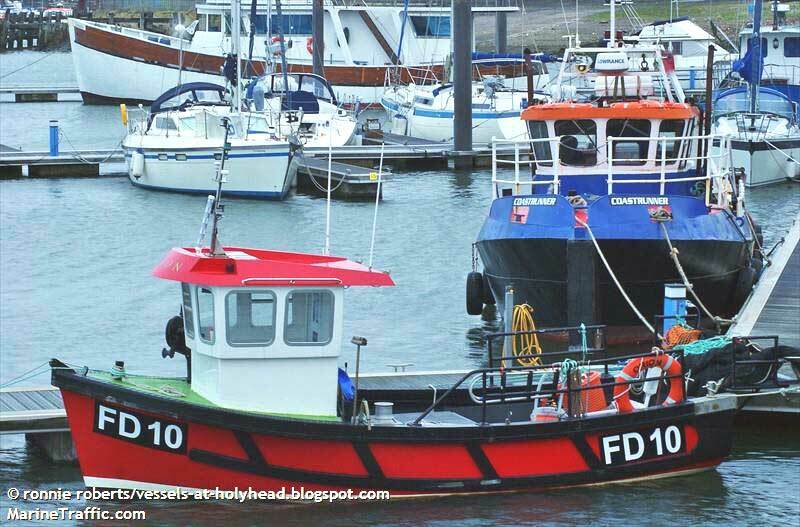 : Ceased fishing and sold to Portsmouth owners for conversion as a diving support vessel. Whaleback which was later removed and a new wheelhouse. 2018: Page published again due to site problems. 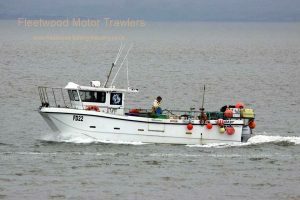 This entry was posted in Motor Trawler, Ward on 26th May 2018 by Roger Jones. 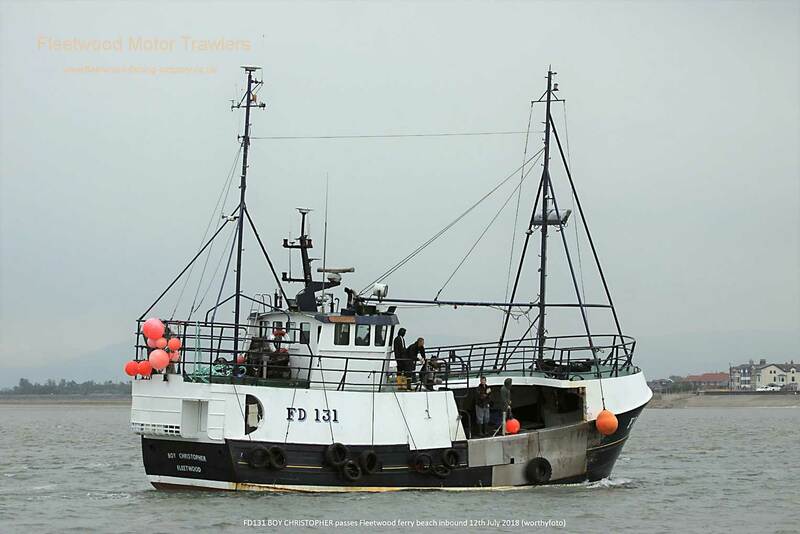 This entry was posted in Inshore Fishing Vessels, Motor Trawler on 5th February 2018 by Roger Jones.